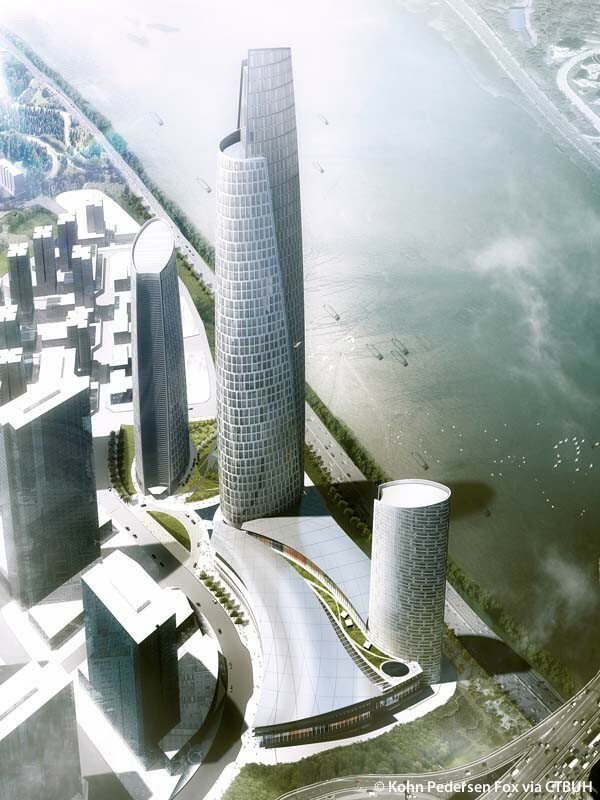 • Wind	 Cermak Peterka Petersen (CPP), Inc.;	BMT Fluid Mechanics Ltd.
• (not specified)	 Brandston Partnership, Inc.
As a centerpiece of the 3.6-million-square-meter Chongqing Tian Di Master Plan, a major redevelopment of the downtown core area, the Chongqing International Commerce Center will provide a nexus of activity, bringing people together for both work and leisure. 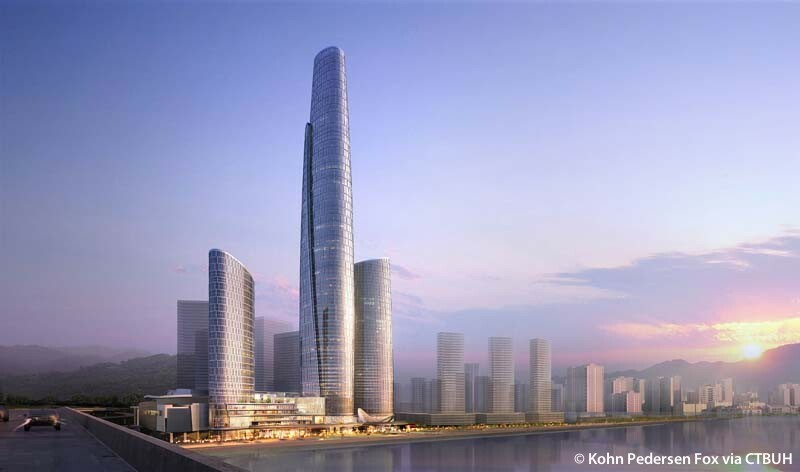 Informed by curvilinear geometry, the complex’s light and graceful form is clearly expressed in the simple configuration of the Corporate Avenue 1, the tallest tower on site. The architectural language used to realize the building acknowledges the city’s ancient cultural, social, and economic origins; the central and local government’s visionary “314” Overall Plan; and Chongqing’s geographic location. The sail design brings to life the commercial junk ships that long navigated the Yangtze and Jialing Rivers, Chongqing’s primary routes to the outside world. The main tower’s two overlapping sail forms generate an oval in plan. The sail form is also evident in the wavelike design of the podium roof. The exterior wall design aims to instill a sense of movement and lightness. Consisting of glass, the façade defines the curving form of the tower, sloping inwards as they rise and adding to the organic feel of the structure. This form also helps to minimize light contamination, as the light hitting the exterior surfaces will be dispersed rather than concentrated. 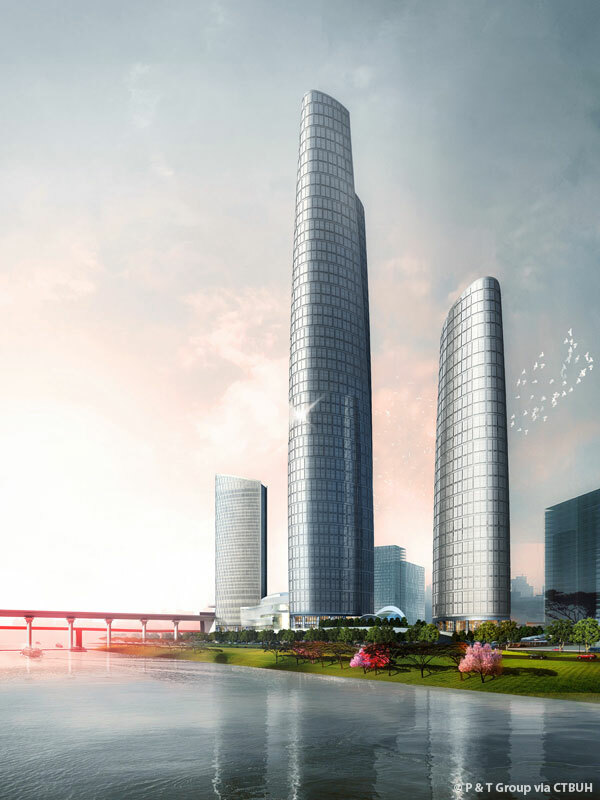 Corporate Avenue 1’s façade pattern is designed to evoke Chongqing’s image as the city of “double happiness,” as window units are organized in groups of two. This allusion seamlessly unites the architectural ambition of the urban renewal project with the city’s plans to incorporate the strengths of its past into the potential of its future. 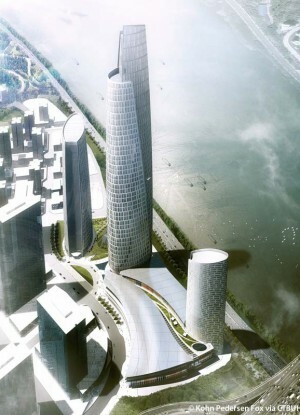 The duality expressed in all three of the towers in the complex is meant to harmonize with these aspirations.